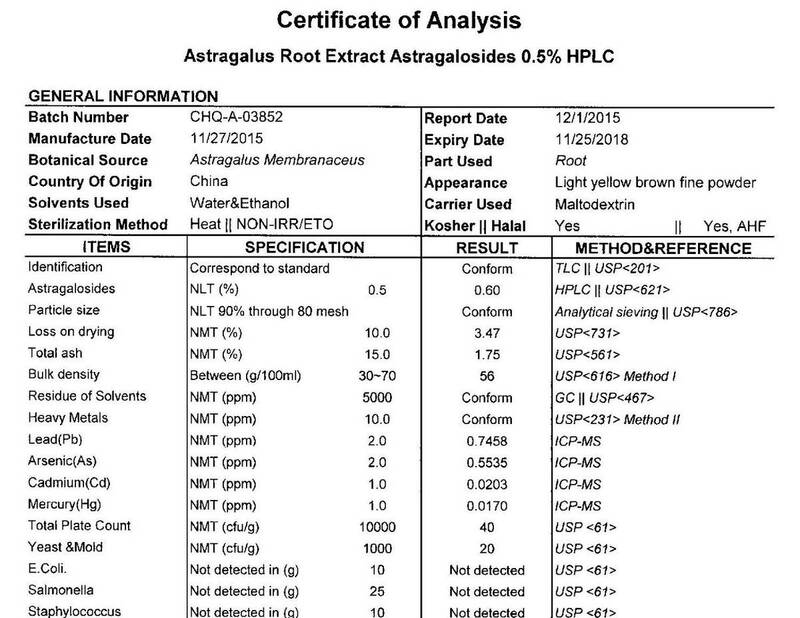 Barlowe's Herbal Elixirs now offers a high potency 0.5% Astragalosides (by HPLC) Astragalus Extract. Astragalus has been utilized in Traditional Chinese Medicine for centuries. It has traditionally been used as an anti-aging herb and to stimulate and strengthen the immune system. It is also an adaptogen. Bottled in Glass! No Stearates! No Fillers! No Junk! 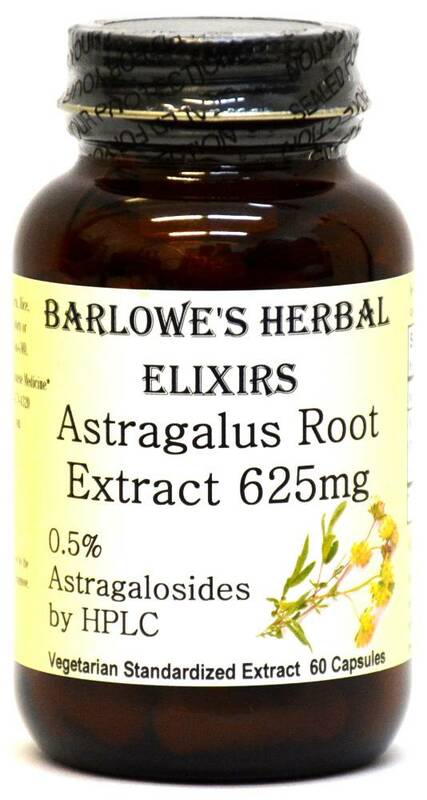 Barlowe's Herbal Elixirs now offers a high potency 0.5% Astragalosides (by HPLC) Astragalus Extract. Astragalus has been utilized in Traditional Chinese Medicine for centuries. The Certificate of Analysis (COA) of this particular batch is shown above. Astragalus has traditionally been used as an anti-aging herb and to stimulate and strengthen the immune system. It is also an adaptogen and may increase general resistance to stress. Bottled in Glass! No Stearates! No Fillers! No Junk! Astragalus contains anti-oxidants, which protect cells against damage. Astragalus is generally used to protect and support the immune system. In the United States, researchers have looked at Astragalus as a possible treatment for people whose immune systems have been weakened by chemotherapy or radiation. In these studies, Astragalus supplements seem to help people recover faster and live longer. 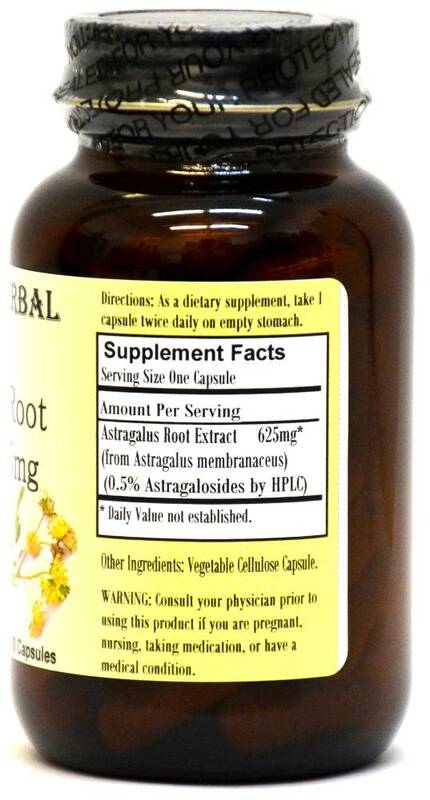 Astragalus may also be a mild diuretic, meaning it helps rid the body of excess fluid. There is a chemical in Astragalus which may help slow aging. Recent research has shown that this special chemical derived from Astragalus can "turn on" an enzyme called telomerase (hTERT). Telomerase acts to maintain or lengthen telomeres, which may extend the lifespan of a person's DNA. CAUTION: This extract is generally safe, but it is potent and should be utilized with care. Astragalus may make it harder for the body to secrete lithium, so if you take lithium, do not take astragalus. Also, do not take if you have an auto-immune disease. This product is for dietary use. If unexpected side-effects occur, discontinue use immediately! The above statements have not been evaluated by the Food and Drug Administration (FDA). This product is not intended to diagnose, treat, cure, or prevent any disease. DIRECTIONS FOR USE: Take one capsule twice daily on an empty stomach. For some people, dosage may need to be increased as results and usage amounts vary based on body type and weight.